﻿ 6 Ways to Increase Communication Within Your Small Business » Red Mango Marketing! « What is Click-to-Open Rate in Email Marketing? We all know communication is an important element to a successful business. But is the way you communicate with your employees working? In a 2016 survey by Digital Workplace Communications, 48% of respondents felt their employers needed to rethink digital communication. Whether you’re sending out emails, instant messaging, or using the phone to communicate with your team, you have to make sure it’s effective and works for your employees. Effective communication leads to increased collaboration and productivity. Here are some ways you can increase the communication in your small business. Email is a common method of communication in businesses and works well in many situations. But this isn’t always the case. In fact, email can sometimes make your employees feel separated from each other. It also makes it tedious for a person to catch up in a conversation because they have to read through a long thread of emails. For quick communication with employees, a chat option may work better. Also, jumping onto a video call could provide clearer conversations than what an email might get across. Try using applications and software designed to improve business communication. For example, Slack is a platform intended to improve communication and collaboration. Another popular app is Skype, which allows your employees to instant message one another, as well as video chat and have phone calls. It may sometimes be necessary to send a business letter. A business letter is a formal piece of communication with your business logo and name in the letter head. Use a business letter to communicate important messages. You can send them through the traditional mail system or electronically. You may have to use this method to communicate with vendors, clients, customers, and your employees. A business letter can help build a relationship. You can send one to a new vendor or customer as a way to introduce yourself and your business. It’s also used to communicate private matters with an employee. For example, your HR representative may use a business letter to communicate with an employee on important subjects, such as salary changes, title changes, or even benefit explanations like workers’ compensation. More meetings don’t always resonate well with employees. It takes time away from the day. If you fill your employees’ days with meetings, it can be a distraction to their work. Instead, schedule meetings when it’s necessary. Here a few things that can help you determine if you should send an email instead of calling a meeting. Do you just need an answer to a question? Do you need simple feedback? Are you just sharing information? If you answered yes to any of these, consider just sending an email. Meetings should be reserved for discussions. If you find that an email chain has turned into a pen pal situation with constant email communications, then you can set up a meeting or conference call. Also, if you’re going to schedule a staff meeting, try to do it Tuesday afternoon at 2:30. Research says that’s the best time and day to schedule a meeting. Set a goal. The meeting should have a defined purpose. What are you hoping to have accomplished at the end of the meeting? Set an agenda. This keeps the dialogue on track. An agenda can also help you run the meeting without going over the allotted time. Only invite the employees that need to be there. Invite people who have stake in the overall goal of the meeting, people who have information relevant to the stakeholders, and people who have done work, or will do work that is relevant to the overall goal of the meeting. Create a safe meeting environment. Safe meeting environments are created outside the meeting. Correcting employees who yell, talk over others, gossip and steal ideas will help create a safer meeting environment. Find the best way to communicate your message. Whether you have 30 minutes or an hour, you have to make sure your employees understand the message you’re trying to convey. PowerPoint presentations are popular options because they can help explain your message and provide supporting materials. But they can also be distracting. “People who know what they are talking about don’t need PowerPoint,” said Steve Jobs, the late co-founder of Apple. Instead of featuring slides with heavy text and data, Jobs used slides to drive home a few key points and serve as a visual element. As the business owner, your employees will likely have questions for you or reach out to you for help. If an employee emails you or reaches out to you, be responsive. You should aim to respond to them within a reasonable amount of time. According to a recent study, 41% of people expect a coworker to respond within an hour. Bosses and business owners can probably get a little extra slack on that time, but not much. Expected response time also depends on the generation of the person waiting for your reply. 39% of millennials and baby boomers expect a coworker to respond in one hour. Gen X is a little less patient. 45% of them expect a response in one hour. One way to make sure you’re being responsive with your employees is to have an open door policy. An open door policy makes you easy to access and gives your employees a prompt response to their inquiry. With an open door policy, an employee can come into your office and speak with you. Your employees will start to feel more comfortable around you and feel that you value them as a member of your team. There’s a difference between hearing what someone is saying and actively listening. Active listening is a skill and it requires focus. Here are a few ways you can became a better listener for your employees. This includes your smartphone and your laptop. Don’t check text messages or emails while your employee is talking to you. This can help you follow along with what your employee is saying, and help you retain the information later on. Let your employee know if you’ll be taking notes on your computer. That way they don’t think your busy firing off emails while they pour their heart out to you. You can’t hear what someone else is saying if you’re busy talking. Ideally, your employee should do about 70% of the talking if you’re receiving feedback. It’s tempting to turn a conversation back to yourself. Don’t. Make sur e that the conversation stays focused on the employee as much as possible. You’ll better understand what your employee is saying if you summarize their thoughts every now and then in the conversation. This can also help your employee feel that he is being heard. Create a way for your employees to give you feedback. The feedback can be anonymous or an employee can identify themselves if they choose to do so. When you review this feedback, don’t ignore it. Even if it’s a negative comment, read it and learn from it. These are coming from your employees and addressing it can help grow your business. Plus, if they see changes made, it increases the culture around the business. You want to make sure you’re communicating in the most effective way with your employees. Understand that various methods of communicating serve different purposes. Email is still a common way to reach out to employees. Instant messaging platforms, like Skype and Slack, are becoming more popular. They allow for easier communication between employees and different groups of people. And for those important communications, sometimes a business letter is appropriate. As a business owner, you can develop practices that help increase communication. Adopt an open door policy so your employees can comfortably approach you. When you meet with them, listen and respond to them. And when you’re given feedback, listen and react honestly. 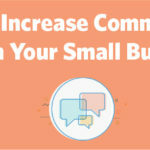 The post 6 Ways to Increase Communication Within Your Small Business appeared first on Constant Contact Blogs. This entry was posted on Tuesday, December 4th, 2018 at 7:30 am	and is filed under Business Tips, Fresh Insights, News & Updates. You can follow any responses to this entry through the RSS 2.0 feed. Both comments and pings are currently closed.